Chapter headings and sub-chapters: Tribology from Antiquity to Our Times. The prehistoric period. The Greek and Roman period. Middle Ages and Renaissance. Toward the Industrial Revolution. The Industrial Revolution. Tribology in the 20th century. References. Lubricating Oils. Base oil. Additive agents. Viscosity of lubricants. Viscosimetry. Viscosity variation with temperature. Viscosity variation with pressure. Lubricants specifications. Non-Newtonian behavior of lubricants. Viscosity of gases. General Equations in Hydrodynamic Lubrication with a Newtonian Fluid. Generalized equations of the mechanics of viscous thin films. Physical interpretation. Energy equation in the mechanics of viscous thin films. Particular forms of the generalized equation of the mechanics of viscous thin films. Boundary conditions for smooth surfaces. Solving algorithms. Calculus of various parameters of the contact. Study of elementary loading cases. Applications. Remark on the Reynolds equation. Plane Sliders and Thrust Bearing Pads. Plane sliders with fixed geometry. Pad of finite dimensions. Thrust bearings with fixed geometry. Tilting pad thrust bearing. Global thermal effects. Theory-experiment comparisons. Static Characteristics of Journal Bearings. Laminar journal bearings. General considerations. Infinitely long journal bearing. The short bearing. Finite journal bearing. Global thermal effect. Application to the design of a journal bearing. Theory-experiment comparison. Dynamic Characteristics of Journal Bearings. Reynolds equation in dynamic regime. Linear modelling: dynamic coefficients. Infinitely short bearing. Infinitely-long bearing. Finite width bearing. Stability of journal bearing operation. Linear analysis. Theory-experiment comparison. Non Circular Journal Bearings with Fixed Geometry and with Tilting Pads. Multiple-lobe bearing. Tilting pad journal bearing. Journal Bearings Subjected to Dynamic Loading. Rotor bearings. Study of connecting - rod bearings. Influence of Shape Defects and of Surface Deformations. Basic equations and general considerations. Shape defects linked to machining flaws. Shape defects generated by deformations under dynamic loading. Shape defects generated by instantaneous deformation in transitory regime. Thermal Effects in Hydrodynamic Journal Bearings. Basic equations. Numerical methods. Results. Theory - experiment comparison. Superlaminar Flow Regimes. Inertia forces in bearings in laminar regime. Taylor's vortex regime in smooth bearings. Transition in thrust bearings. Turbulent flow. Comparison between theoretical results and experiments. Application to a turbine bearing. Thermal effects in non laminar regime. Hydrostatic or Hybrid Journal and Thrust Bearings. Principles of hydrostatic lubrication. Study of a simple hydrostatic thrust bearing. Main thrust bearings with simple action. Hydrostatic pads with double action. Hydrostatic journal bearings. Hybrid bearings in non laminar regime. Comparison between theory and experiment. Technological Aspects. Preliminary choice of a technology. Rough design of a hydrodynamic bearing. Examples of actual bearings. • the appearance of Taylor's vortices and of turbulence and their repercussions. The book contains an abundance of test results objectively compared with theoretical conclusions and a chapter on "technical considerations" to ensure that draft mechanisms will work satisfactorily under the imposed conditions. 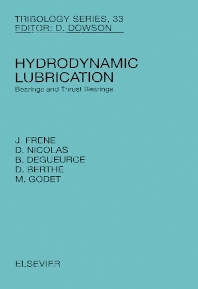 Hydrodynamic Lubrication is an essential reference book for future and practising engineers who want to put hydrodynamic and hydrostatic journal bearings and thrust bearings into operation under conditions of total safety. For students, researchers and practising engineers working in the field of hydrodynamic lubrication.